I’ve taken some liberties with text and melody in the above performance! Go to lovely Minnesoty, that Lily of the West. And sailed for Minnesoty, the Lily of the West. That’s the fashion of Minnesoty, the Lily of the West. They’re the darlings of Minnesoty, the Lily of the West. We have pleasures in Minnesoty, the Lily of the West. We’ve industry in Minnesoty, the Lily of the West. We have all things in Minnesota, the Lily of the West. And they call it Minnesoty, the Lily of the West. Again this month we have one of the very few songs I’ve found that mentions my beloved home state. 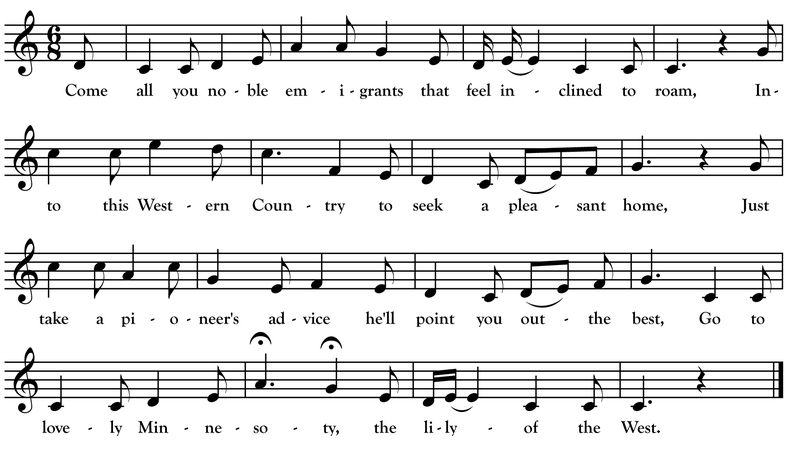 In this case, it’s a song of praise, advertising the wonders of pioneer-era Minnesota to prospective “emigrants.” Bessie M. Stanchfield collected a version of the song, titled “The Beauty of the West,” from Mrs. Elma Snyder McDowell of St. Cloud in 1936. Stanchfield went on to gather three other Minnesota-sourced versions and all four texts were published in her article “‘The Beauty of the West’ A Minnesota Ballad” in the September 1946 issue of Minnesota History. The Snyder McDowell version was the only one collected by Stanchfield that came complete with a melody. The above melody comes from the singing of Ezra “Fuzzy” Barhight who was recorded by song collector Ellen Stekert at his home in Cohocton, New York in the 50s. The text is primarily one of the texts published by Stanchfield that she found in the Saint Peter Courier of June 26, 1857. It is quite different than the other three published by Stanchfield but similar to Barhight’s fragment. I mixed in some lines from Barhight and the other Stanchfield texts to create the version above.